Crossroads Magic with mixed media – changing your life is a journey! Where paint meets paper, where job meets career, where relationships with others meets relationship with self…the glue that holds it all together is our ability to honour where we are. One edge against another as clear as black and white, or a transition as smooth as lava rock, surprise yourself! Enjoy the discomfort of stretching your body, your mind and your soul in the process. The wisdom of Life and Art, just as it is. 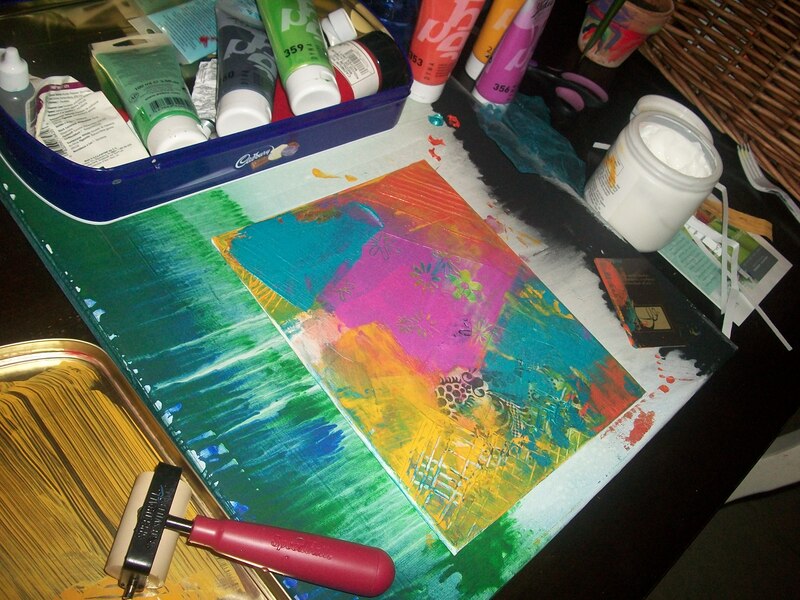 Mixed Media in the making! How impatient we become sometimes when we find ourselves sitting (or kicking, screaming and pouting) at a crossroads. We want to be over there and forget that to go THERE, we need to be HERE, and to be here, we simply need to… BE. My latest ‘crossroads season’ lasted 5 1/2 years! It was a place to welcome a new life; a new life that required night time feedings and diaper changing AND a new life on my own… AGAIN! It was a place to heal a broken heart and to pick up the pieces of shattered dreams. It was also a great place to hide to lick very deep wounds and celebrate the many offerings along the way. This is where I grew a new skin, leaving the old ones behind. I stood still long enough to stop the bleeding, to soak up the sun and to stretch my passions as canvases started lining up in front of me. Listening, REALLY listening, became the springboard to the next layers of ME and the life I create for myself and my children. In those years, amazing people stumbled upon my rocky path. Some helped me clean out the very stinky garbage from seasons past, some helped clear overgrown fears and uncertainties, and some helped me lay down stone after stone to rebuild a solid foundation for my creative expression and the expression of my creative life. Crossroads are exactly where you need to be. While you are standing there, remind yourself of what you stand for, pick up some tools and dig a little deeper. Plant a few seeds along the way, make friends, and get clear. It’s a time to engage and make the journey your own. Crossroads deserve to be trusted, cherished and loved just as much as the most glorious moments of our lives. They ARE the glorious moments; moments that inspire, create and transform. There will always be crossroads. Celebrate your growth. Believe in your magic!